I submitted a proposal for a musical ballpit (with deathboy) to EMFCamp and had it accepted! I played Ingress quite a lot, and therefore did a lot of walking. This was mostly because I started going to Ingress meets, met some cool people and made some new friends, and that motivated me to play more. I went on a tour of 55 Broadway, the old TFL office. It was an interesting tour, seeing the lavish decor in places and hearing about why the building was designed as it was, and oh, there were wonderful views from the top. I went to Victoria Park for a Robot Picnic, which was for people who are interested in bots, and I heard about the bots people had created and thought about what bots I could create. I went to GameCamp, a barcamp about games. It is an event that anyone can speak at if they want to, by just writing the name of their talk/whatever onto a card and sticking it in a time slot next to a room name on the board. There are also games to play. The event happened at the London South Bank University. I went to the Chisenhale Gallery to see the exhibition by Maria Eichhorn. The gallery is closed for the duration of the exhibition and the staff are not working, so all there is to see is a closed gallery and a sign explaining this. One evening, at the Barbican, I saw a preview of Richard Linklater's film, Everybody Wants Some!! and afterwards, Richard Linklater answered questions from the audience. He is my favourite director/writer, and has created wonderful films such as Before Sunrise/Before Sunset, Slacker, etc, so I was very happy to be get a chance to see him answering questions. This film was based on his university days and it made me a bit nostalgic for that time in my life also, although my time at university may perhaps have contained less baseball. It was a fun film though. I took a train to Motspur Park on a sunny day and walked through a park and got a good view of some gas holders. I walked into the cemetery and behind the chapel I found the Morden Cemetery Horse Chestnut, one of the great trees of London, according to Time Out. I stood underneath, hidden by the canopy and the trees were covered in ivy, and I wondered how many conkers they must have produced over the 100 years or so that they had stood there. I took part in Clay (Clothes in May), where I posted about what I was wearing on each day in May on LiveJournal and posted pictures most days. I investigated the mystery of the wooden table. I heard tourists talk excitedly about the pterodactyls they had seen, as I walked through St James's Park one lunchtime. I went to the Natural History Museum with kekhmet, augeas, flavius_m, alexmc, Melanie, Ann, Emma and Wim. We went to see the Otherworlds: Visions of our Solar System exhibition. There were wonderful photos of the Moon, the Sun, Mars and other planets, and music by Brian Eno accompanied the exhibition. After that, we went to Tombo and I ate a matcha sundae and a matcha almond shake. I went to a team away day and listened to two external speakers. One spoke about Getting Things Done, and the other on topics such as bots, narrative science, data verbalisation and Netflix algorithms. Then we went to play urban golf. Urban golf involves standing in front of a large screen, hitting a (real) golf ball with a golf club and then seeing it fly through the air on the screen. It was voting day, and I had forgotten to post my postal vote for the mayor of London, so took it to a polling station in my borough - the library. As I came out of the library, I was approached by a man who said he was a cartoonist. I apologised and quickly walked away. Sometimes my life feels enough like a cartoon already. I got asked for ID in a Co-Op. My Starbucks name was "Godi". The barista wrote down "God" and then looked at me a bit confused, so I then told her there was an "i" at the end. One evening, I got to Level 10 on Ingress, and in real life, there was a misty sliver of a moon, lit up trees and a moth fluttering past. I went to Pub Standards for monthly drinks with web folk. I met up with the lovely oedipamaas49 at the White Swan and we ate some food and somehow ended up talking about shoes (and other things). Then we went to the Garage to see the Memepunks (with special guest sbp! ), Joe Black and Aurelio Voltaire. One Saturday, I wandered into Richmond, visited the Riverside Gallery and saw an exhibition on "A sense of sound". I bought freshly ground Guatemalan maragogype coffee at Rosie & Java and nutella ice-cream from Gelateria Danieli. I then wandered onto the Green, where the May Fair was happening and I watched some Morris Dancers on the stage. That afternoon, I walked through Marble Hill Park and said "hello" to the nymphs in York House Gardens and then walked through Twickenham, to the Mereway Nature Reserve, where there is a cute fox carved into a bench, which you can sit next to. I followed the River Crane and walked into Kneller Gardens, where there were wooden rabbits and giant wooden woodlouse, and I sat in a patch of daisies by the river for just a few minutes, and then I walked back, and somehow that day I'd walked 14.6 miles according to my watch, but I didn't feel like I'd walked anywhere in particular. I went on a tube walk from Pinner to North Harrow and we walked through quite a few parks and it was a nice day. After that, I wandered around Baker Street, and completed an Ingress mission, then around Hammersmith, where I saw the Rik Mayall memorial bench. I cross-stitched another lemming, as I still hadn't found my original lemming necklace. I went to an Ingress meet in Richmond and there were cakes and morris dancers and laughter, and I was given some Ingress kit and taught a bit about strategies. I travelled up to Nottingham for work and spent most of the afternoon listening to phone calls. I also had a meeting about a form I have been designing and tried to think up slightly more amusing error messages. I stayed in the hotel that has a lift with sparkling lights. That evening, I got drenched and ate a burrito and churros for dinner and then walked around for a few hours, looking at the graffiti and reading about Robin Hood, and completing some Ingress missions. I returned to London and walked up to Richmond Park and oh, it was nice to walk around there. I saw deer and I climbed inside a tree. My Starbucks name was "Jamie". I went for a walk around Kingston-upon-Thames, through parks, and along the river, following a set of Ingress missions for where to walk, and then, outside a pub, one of the Ingress people I had met the week before stopped me! He had just been for a drink in the pub with some of the opposing team and they knew I was going to be walking that way shortly. I like this aspect, where the game and real life are mixed up somehow. I went to the Pembury pub and met up with friends as compilerbitch was visiting the UK. I drank some elderflower cider and some strawberry cider which tasted like strawberry jam. I had dinner at the Four Regions restaurant and enjoyed catching up with doseybat. I went to a colleague's leaving drinks at the Colonies. I stayed a night in Portsmouth and looked at some brutalist looking churches. I arrived in Guernsey and then that evening, walked down bright pink campion covered lanes, and down a path to an old abreuvoir, and past large brutalist water towers, and then the sun appeared, across a field, as a massive ball of glowing orange. 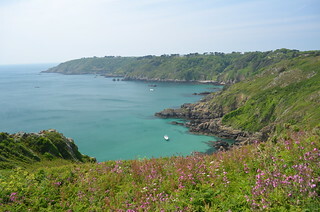 I walked to Fermain Bay, and then along the coast to Jerbourg Point, and across to Moulin Huet Bay. I walked along country lanes (ruettes tranquilles), wandered across clifftops and on beaches. I walked amongst campion and navelwort and bird's foot trefoil and honeysuckle and fuchsia. I saw a slow worm wriggle across the path I was walking along. I saw waterfalls, hid inside a cave, and walked past a loophole tower. I visited Sausmarez manor, which had a sculpture trail in a sub-tropical garden. I walked past angel's trumpet and giant viper's bugloss, and past two turtles, who I at first thought were sculptures, and I read poems stuck to trees about chickens on the internet and flower fairies. I looked at faces in trees and abstract forms, and sculptures of magnolia trees and horses. I got a bus to L'Eree and walked on the beach, and then past Fort Saumarez, which has a World War II tower stuck on top of an 18th century tower. I visited Cobo Bay, which was beautiful, with rock formations close by and in the distance, and I felt as if I were in a magical kingdom then. In Saline Bay, I saw black and orange shells on the beach, and walked up to the Rocque de Guet Watchhouse and Battery, a Napoleonic watchtower. I walked around town (St Peter Port) for a while, and then caught a boat to Herm. Herm is a small island about 20 minutes away from Guernsey. On Herm, I hid inside a small beehive shaped prison. I also saw a shark teeth vending machine, looked inside Robert's Cross chambered tomb (dating from between about 2500BC and 1200BC), saw rabbits and pheasants and caterpillars and possibly a seal, walked across Shell Beach, stared at the alien looking onion (?) buds that poked up next to the pathways, and walked along the coastline around the island. Well I wouldn't have come here if you hadn't also posted the link on fb :) Nice to read about your month! Also, you phrase it differently so I am now imagining you in the pub with Spiderman and selkies and frog princes: "drinks with web folk".